Attention deficit or a constant? People often argue that we have too much infor­ma­tion and too lit­tle atten­tion; that this is a con­di­tion of being “mod­ern.” But the opposite may be true: that atten­tion is a human con­stant and that it con­stantly seeks new forms. Where there’s “sur­plus atten­tion” we always come up with things to occupy it. Was the past sim­pler, with less infor­ma­tion to dis­tract the mind and less to worry about? That can’t really be true: there’s nothing sim­ple about farm­ing and the nat­ural world is full of infor­ma­tion we’ve lost the capacity to discern. This is an interesting thesis when you link the recent work in finance on information and attention. We are always trying to fill out attention with information. We generally are not overloaded with information. We can handle a lot. However, Herbert Simon, the nobel prize winner in economics would say that we have become information rich and attention poor. Information computation transmission and storage has each increased multifold but our attention has stayed stable. We may have switched from depth to speed of acquiring information and knowledge. Knowledge may have moved from a "stock" to a "flow" concept. We consume information at a faster pace regardless of quality. The type of information could be the issue especially if it is new. The problem is whether there information is useful and can be processed correctly. This is the role for decision sciences. Headline and core inflation - no link with commodities? From the FRBSF Economic Letter: Does Headline Inflation Converge to Core, we see that commodity prices will not often drive inflation. 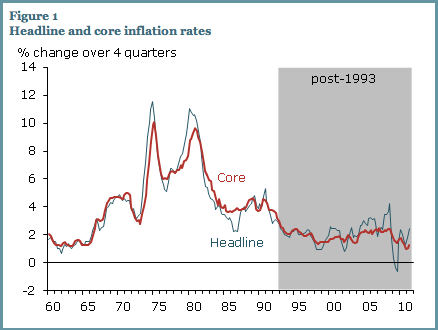 In reality, the headline and core inflation mix has changed. Pre-1993 there was strong co-movement between headline and core. Inflation persistence was higher in the 70's and 80's and has fallen in the last twenty years. In the post '93 period there is not a close link. The conclusion is that inflation expectations are well anchored, but this is an observation and not an explanation. Some researchers have argued that the delink is caused by the widening employment gap. I would argue that the decoupling has to do with a greater focus on inflation targeting by the Fed. The Fed will keep rates within a range and not allow the headline effects to be monetized. If there is a change in Fed behavior with less focus on inflation, expectations will become more focused on headline prices. The result may be a return to the '70's. This delinking also explains why commodity investing has not been an effective hedge for inflation. Inflation expectations are range bound which results in a lower correlation with a basket of commodities. This is a very clear statement on the importance of confidence and credit when addressing a downturn in the business cycle or a financial crisis. Does this need to change? There is no question that both have to adapt. "We are all capable of believing things which we know to be untrue. ... The only check on it is that sooner or later a false belief bumps up against solid reality, usually on a battlefield." Hard to say whether the current Greek solution will work. There is a lot of money being thrown at the problem which still has to be raised. Creditors have to realize loses.Central banks will have to provide liquidity and monetize some of this debt. Saying there is a solution is not the same as having a solution. China premier Wen Jiabao stated the government must continue to control food and housing prices to ease inflation which is currently above 6 percent. This is going to be an interesting test of the Chinese government against the global commodity markets. It was stated by government sources that corn imports may go from 970,000 tons to over 5 million tons in this year. China is willing to use its cash horde to buy as much food as possible to stop price increases. Of course, if you try and hold prices down inside China through buying in the global market, someone is going to get rich at the government's expense. There will be a cash transfer and it will show up in futures prices. There have been a number of key descriptors of the current market. With the shifts and turns in the global financial markets, there have been an ever increasing number of names for this troubled period. We have called this the AGE OF UNCERTAINTY given the high volatility coupled with the growing unknowns about policy and economic data. We have also characterized this period as a COMMENTARY MARKET where the opinions of policy-makers or comments about policy initiatives have been the driver of market action. This period can also be called the AGE OF AUSTERITY based on the slow growth in developed countries. The gap between potential and actual output has not been closed since the start of this recovery. The developed markets seem to be in a state of lethargic behavior. We feel the key problem is the confusion between an environment focused on liquidity or solvency. If this is a liquidity problem, central banks can solve. If these are solvency problems, we are in for the long-term austerity environment. If we have both, governments could be driven to a set of choices which are extremely dangerous. It is a financial repression age which will be the greatest market scare. There has been a significant decline in prices which may lead to an eventual increase in demand but it can more immediately change the buffer stock and will lead to an inventory decline. With falling price, the desire to hold inventories relative to financing costs decline, so inventories will be reduced first. The decline in inventory in warehouses will then ultimately lead to demand for metal from miners. This is a consistent and usual inventory cycle story associated with most business cycles. Base metals have become more like equities in the current cycle. Market power can come from buyers or sellers. In this case, China demand represents the entire deficit in copper relative to production. Nickels is more sensitive to EU and US slowdown given its higher usage at about 1/3 of global demand. Most metals like aluminum copper and zinc are 25%. Correlation with equities have moved higher from about .3 to .5. Sensitivity to a one percent decline in equities is .8 for nickel and .45 for Aluminum.Speculative copper has fallen off a cliff and has moved from net long to net short. Base metals are affected by marginal cost curves which makes for uncorrelated markets given the cost curves are different. If prices move above marginal costs based on overly positive expectations, there will have to be a decline when price expectations are revised down. That will occur when global growth is expected to slow. Copper may be the most sensitive to a slowdown based on the current difference between price and marginal cost of miners. Aluminum which is affected by smelting costs will not have the same price sensitivity. The marginal cost curve is steeper even with the sizable over capacity in smelting. The will be a point where marginal costs will match existing prices at which there will be a change in speculative flows. It seems like the silver market may have returned to normalcy. The year has been anything but normal. It has been pushed dramatically by speculative flows. After pushing up toward $50/ oz, we are now in the low $30's/oz. Silver has had a dramatic increase in its beta relative to gold. It has moved close to 2 in the last 2 years from a previous level of approximately 1.35 for the previous five years. More recently, the beta has started to move lower. Silver has had an unusual year broken into four parts. Part one was the speculative run-up through the end of April. The bubble burst with and diverged from gold. Part two was the consolidation through September when the market broke a second time in concert with gold which was part three. The current part four is the second consolidation. The breaks in price have been associated with CME margin increases. A rapid combination of five margin increases raised margins by 84%. The September break was matched with another margin increase. 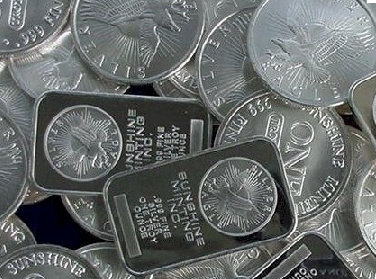 The COMEX through the CME clearinghouse forced liquidation of the silver which changed the mix of players. This stopped the increases in speculative activity. What is the feedback between margin increases and market price changes? Margin increases are usually associated with increases in volatility and volatility increases will usually lead to a shake out of speculation. The risk increases relative to reward, but a clear margin increases translate into real cash. There is more money needed to hold any position; consequently, there will be an exit by speculative players. With an exit of marginal speculative players, there will be a return to more normal relative price linkages. Yet, the issue of why there was strong demand has not been addressed. The demand for poor man's gold still exists. The corn market is going to change in just a few weeks. The ethanol tax credit is worth about 54 cents per gallon for ethanol producers. 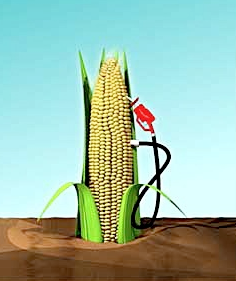 Ethanol now takes up 40% of the corn crop, so as goes gasoline and ethanol so goes corn. It is likely that the credit will expire at the end of this year. Ethanol producers are doing what is expected. They are producing as much ethanol as they can before the tax credit expires. This has placed strong short-term pressure on corn from these consumers. Current gasoline futures only trade at a penny premium to ethanol versus 35 cents for next year. 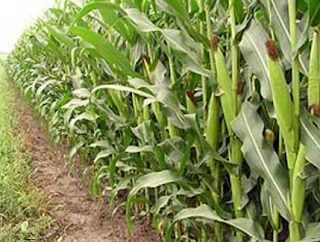 The tax credit represents an increase in corn prices of about 16 cents per bushel. If this demand declines, there will a price decline just when farmers are making their planting decisions. We will see a combination of less demand and more supply. This is never a good combination of price increases. Experts are by definition hedgehogs. They are specialists in a field. Their mistakes are specialized and it is their failures with very specific problems that make them experts. Experts will usually not make the same mistake twice. This specific experiential learning is valuable. You cannot gain perspective from reading newspapers. You can only gain perspective through developing a framework and placing daily events within the framework or theory. The daily banging of the drum concerning the greek debt fiasco provides new information every day but there is limited perspective of what this means for investing or the risks in the European political structure. For that you need time and theory. In this Occupation Wall Street environment, many will nod their heads in agreement. Yes, yes, finance eats its own. The Balzac quote has often been used, but it is not exactly clear what was meant by the comment. The quote is from The Firm of Nucingen and refers to the making of family dynasties in banking. Behind every great fortune is a crime. Everyone in agricultural markets has been surprised by the increase in corn stocks with the latest USDA report, yet we only have to go to basic economics to understand what may be happening. While the evidence is limited, there is clearly changes in market dynamics which provide a rational for the wild inventory discrepancies. There has been a substition effect between corn and wheat by livestock operators. When corn is more expensive than wheat, which usually sells at a premium, there will be a switch. The result is then an excess inventory of "found" corn. The issue is to what degree this substitution occurs. But, wheat stocks also were surprisingly higher. Again incentives and arbitrage were the likely causes. Canadian wheat was of lower quality this year which meant that there was an oversupply of feed wheat which was then shipped to livestock operators in the US. 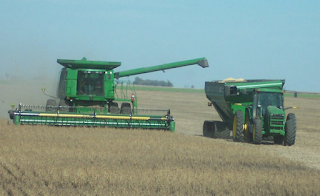 The flood of cheap Canadian wheat meant that counting bushels in the US showed a higher level. This is also one of the reasons for sharply higher Minneapolis wheat. Always follow the money and the incentives. The agricultural markets will become more volatile because the USDA will cut some of the reports they produce on demand and supply conditions. The USDA cutback as part of government budget declines will have an impact on trading markets. If there is less information on supply and demand there will be more focus on any remaining report produced by the USDA. This will increase the focus of any uncertainty on specific dates. It will also mean that there will be less overall information and the ability to cross check USDA reports from various perspectives. The cost of hedging will go up given the premium necessary to hedge this uncertainty. Information gathering has a public good feature. Private services will provide some information and in some cases this information may be better, but it will be available only to subscribers first. This will create an information edge, albeit short-term for those that receive this private good. The increase in volatility from cutting information may be lead to real costs in agriculture markets and may be more costly than the actual report production. Given the size of the US agriculture sector and the impact of futures on world markets, this may be the time for more information gathering not less. There is only one group to watch to understand the gold market - central banks. The impact of central banks is twofold, market expectation on global inflation and uncertainty, and central bank buying. Retail flows will be driven by their views concerning central bank policy behavior. More monetizing of securities to defeat deflation will increase prices which will increase demand for gold as an inflation hedge. If central banks, do not get this reinflate policy right, there will be more macro uncertainty which will push gold higher. Sovereign and bank defaults will create flight to safety demand. The other hard to measure demand is the buying by central banks. If you do not want dollars or euros or pounds, the natural alternative is gold. Any central that does not have large gold resources is willing to step up to make large purchases. The sizes are in tonnes. The emerging market central banks with large foreign resources such as the Middle East banks will be the buyers. They will take the other side of retail selling in large price declines. 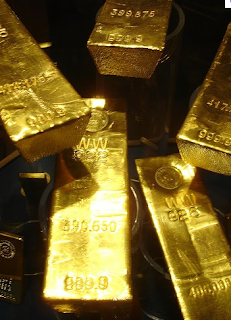 if central banks want to raise prices, it would be natural for them to also be buyers of gold. 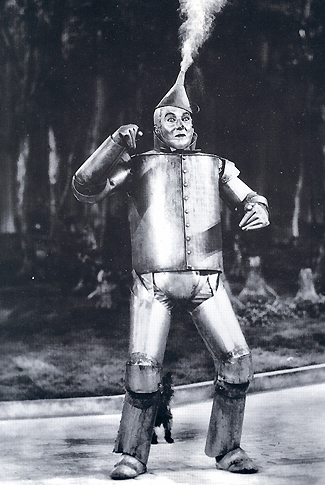 The International Tin Research Institute (ITRI) has reported that there will be a an expected shortfall in the tin market even though prices have fallen by 40% since April. There is a clear reaction to a global slowdown, but the short-term dynamics are masking the reduction in supply from mines and the lower quality of ore being produced. The value of tim production is only about $9.5 billion, so fund flows can have sway over pricing in the short-run. Indonesian is halting exports and China is a net importer after exporting earlier in the year. The market contango has flattened, cash premiums have increased, and warrant cancellations have increased. While growth will still be the key driver for tin, there is a growing opportunity for value investing. Fed Vice Chairman Yellen sent a clear message in a Denver speech on Friday that "careful consideration" should be given to apply more stimulus. Yellen noted that Operation Twist is limited because there are only so many intermediate bonds that can be sold in exchange for longer term Treasuries. This view suggests that a lot more stimulus is needed to push long-rates lower and drive inflation higher. The objective of any QE program is to push prices higher of both financial and real assets as well as wages. This view for more easing has been matched by a recent proposal by Chicago Fed president Evans that the zero interest rate policy should be tied to a specific unemployment rate or inflation rate. This would be code for more stimulus, but with a constraint. The end of the Canadian wheat board is nearing. The CWB has had a monopoly on marketing western Canada wheat since 1942. Legislation for its elimination may be passed by the end f the year. 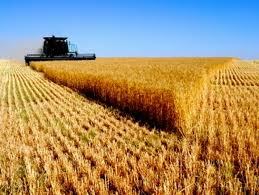 The ICE futures exchange, through its Winnipeg exchange is preparing to offer futures on milling, durum and barley. The Minneapolis Grain exchange is expected to see more trading on its hard red spring wheat contract. The hedging of grains will be placed in the hands of farmers and will not be based on prices provided by the government. This is a major development which will change the movement of grain exports around the world. Nickel has fallen like other base metals on the prospects for lower demand from China. The international Nickel Study Group (INSG) suggests that demand will still be positive next year but the forecast is contingent on the direction of the Chinese economy. China is the marginal buyer of nickel,but a higher percentage of nickel is used in developed countries about 30-35 versus 20-25% for most other base metals, so a recession in the Eu or the US will have a greater impact on price. 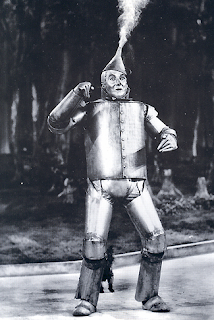 Most nickel (65%) is used in stainless steel or other alloys (20%). Have we had spending cuts? There have not been spending cuts. It is a myth. There may be need for more spending to offset cutbacks by consumers in order to increase aggregate demand, but that is a very different argument than saying there have been spending cuts. A Keynesian story states that government may have to grow more to make up for less spending in other parts of the economy. We believe that more fiscal stimulus is appropriate but it has to be argued from a starting position of clarity concerning government expendtures. China economy grew at 9.1 percent in the third quarter which is the slowest in two years. This is down from the 9.5% growth last quarter and lower than the median estimates of 9.3 percent. While there has been a market reaction, 7% is the likely level which is significant slowdown for China. Pressure on small and medium enterprises (SME’s)companies which have been an engine has been increasing. There are reports that they are starved for capital which much easier to be obtained by the large state owned enterprises. There is also softness in housing and real estate. Property companies are feeling there is tighter money. While there has not been a significant fall in real estate, there is more selling pressure as inventory is sold and price cutting is occurring. There are export driven problems because Chinese exports are tied to ISM numbers in the EU and the US and with developed market weakness there is a link with China. EU is likely in a recession and the US is still gong to be below trend. China will see weakness as this slows exports. Domestic China retail sales is less sensitive to export declines. To maintain the high growth, domestic sales will have to improve relative to export growth. Steel and coking coal prices have turned down with demand slowing Oil and copper prices also are down close to 30%. If the great commodity buyer slows its purchases, there will be a corresponding decline in global commodity prices. Mining stocks should be valued using a classic discounted cash flow analysis based on the life of the mine production times an expected price discounted by the expected cost of capital. The key variables that can further effect valuation include: include exchange rates, given many mining companies are outside the US and prices are often in dollars; capex which drain what is received by investors but also increase the potential supply; and dividends which are not reinvested in the commodity. The macro factors include the risk in the market and global growth which will translate into price variability. Of course, hedging is another variable in the mining equation, but if the mining company hedges, it is suggesting that they do not believe the price gain is permanent or that the volatility is high relative to what it expects. This valuation of discounted cash flows is a long-term price risk not a short term inventory premium which is embedded in futures prices. Hence, futures will be less correlated with mining stocks by being more sensitive to short-term dynamics. Temporary price moves will drive futures prices but will not have a large effect on mining stocks. Long-term or permanent price changes will have a strong effect on mining stocks but not on futures. If mining stock lag futures price returns, it means that the market is discounting the current movement in prices. In the case of gold, mining stocks are suggesting that there will not be the same increase in price as measured with futures. The discounted cash flows do not translate to the large short-term gains or loses with futures. There is a reason to hold both mining and futures positions. With the expectation of a global economic slowdown, there is a renewed discussion about deflation. The ECB can ease because inflation is declining. More liquidity can be added to the market because commodity prices have declined. Central banks should allow for more inflation to help growth. Real rates are negative and inflation expectations in TIPS are falling. There is still little talk about the cost of inflation. This will prove to be a major economic mistake. What if the Grand Plan is not so grand? The G20 finance ministers met over the week-end and urged EU leaders to take decisive action by their Oct 23 meeting. The German finance minister is suggesting that this would not be a final solution and the end will "surely extends well into next year." German chancellor Merkel has stated that "dreams will not be fulfilled"
The plan is not supposed to be a"definitive solution" but will have a new Greece bail-out, recapitalization of banks who have been hurt by the Greek haircuts which should be about 50%, additional resources for the EFSF, and policies to make weaker countries more competitive. So here we are on Monday waiting for what may happen over the next week-end. Should be be ready for something big or temper expectations? Should the rally of the last two weeks be reversed. What do we need to hear next. This is an extreme "commentary market" where what is said or implied drives market expectations. There is maximum uncertainty that could cause major market reversals. Copper demand is driven both by refined product and scrap available for recycling. New import rules in China state that importers of scrap have to be licensed to ensure that environmental waste is not entering the country. Stronger enforcement of these rules has caused bottlenecks in the scrap copper market. This will increase demand for refined copper. The market premium for refined copper in China is starting to firm even with a strong market decline in September. China is the largest importer of copper but imports have fallen 4% from levels last Augst and are down 12% since July. Since the beginning of the year, copper demand is still up 7% which is consistent with China growth. However the International Copper Study Group (ICSG) still estmates that demand will exceed supply in 2012 and that copper prices will firm if China continues to grow at its current pace. Information on copper can be found on the International Copper Association CopperInfo website. The demand for copper can remain strong because of growth in emerging markets, but it will still will have a strong cyclical compoent with the global business cycle. Good summary article in the Telegraph on the most celebrated attempts to squeeze different commodity markets. Squeezes have long been a part of the futures market given there has to be convergence of the futures and cash market and there are deliveries of the actual commodities. The potential for ssqueezes is just an another issue that many have with speculation. Speculation is viewed as having a destabilizing effect on price discovery and the effective functioning of markets. Few seem to believe that speculation can provide liquidity and can drive prices to equilibrium levels. The size of futures trading can outstrip the supply that is available for delivery. This is normal for futures and generally will not cause conditions for a squeeze. Buyers and sellers note that there is the potential for congestion at delivery and therefore roll futures positions away from delivery periods. Squeeze will destroy the market dynamics; therefore the exchanges will monitor market behavior even without government regulation. The chance for squeezes is one of the main reasons why the CTFC collects position information and there are position limits. Monitoring position limits is not used to stop speculative activity but to determine whether there will be significant price variations at delivery because there is a bias of buyers or sellers who could manipulate prices. If there are large price divergences at or near delivery, the futures cannot be an effective pricing mechanism. The value of the futures market as a public good dispensing price information will be destroyed. The current monitoring of positions is adequate for controlling the potential for squeezes, but the changing dynamics of speculation may require a dynamic regulatory approach with position limits and monitoring that is more flexible than the current system. A dynamic system will add uncertainty about rules but will provide a safety net for all market users. What is so surprising about the jobless claims numbers is that they are not that surprising and should be viewed as following an expected pattern set by the last recession.The charts above show initial jobless claims and continuing claims since 2000. What has changed from most post-WWII business cycles is that the claims numbers are very sticky and take a long-time to decline. Initial claims are not much different from the the 2001 recovery after the initial reversal took place in 2009. Continuing claims are similar to the 2001-2002 period. Changes in the economy with more part-time work, less manufacturing, and changing skill requirements to name just a few, make it harder to bring down longer-term unemployment. It was a mistake to think that we would have gotten more success. One mistake was to believe the adage that a steep decline will lead to a steep recovery. What is important in the current political environment is separating good policy from emotions. The emotions are associated with bad implementation of policies or rejection of policies that would be good for the country. 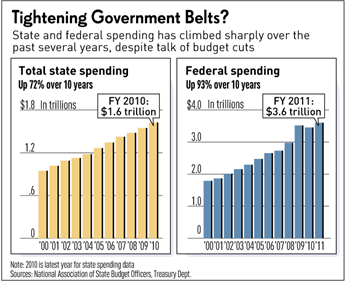 People are upset if they think the government is wasting money yet private business or citizens have to belt-tighten. Action from the government is desired if it is done efficiently. Since there is limited confidence on government efficiency, there is pressure to balance the budget and cut government expenditures. There has not bee a strong case of government efficiency. Waste reduction and good management have not been high priorities. UK Prime Minister David Cameron calls for a "big bazooka" solution to the euro zone crisis and that Germany and France put their differences aside. According to Cameron, euro zone leaders just have a couple of weeks to stem the crisis. Interesting analogy similar to what was used by Treasury secretary Hank Paulson in 2008. I thought you were supposed to have a big bazooka but not use it? Jim Chanos is negative on China. He has pushing this negative story for what seems like years. Bloomberg reported that he is shorting Vale the Brazilian iron ore company and other commodity related firms selling into China. Vale reported sold 41 percent of production to China in the first quarter. This may be a more effective way to trading China equity and economic risk than taking short positions inside the country. This has strong implications for commodity markets if other traders are going to follow the same path. Industrial metals prices will remain heavy with China growth uncertainty. Gao Xiqing, head of the $00 billion sovereign wealth fund On Charlie Rose- "somehow, your system has come to some sort of a dead end"
Does this sound like the Japanese in the 1980's? The sustainability of growth in China is as great an issue as growth in the US. The US model is viewed as suspect by the Chinese, yet it is not clear what is the Chinese approach. Red capitalism with state activity and direction does not seem to be viable over the long-run. Others have tried this approach with limited success. For the Chinese, strong private growth has not really taken off until WTO entry. China cannot separate itself from the US. China needs strong growth in the US. The bond vigilantes are sheep. They are acting now as a weak herd driven to safety without regard to long-term credit risk and debt issues. The assumption by many bond managers is that their vigilante behavior can come later after the current risk crisis is over, but this view misses the point. The crisis is a balance sheet credit problem and not a classic inventory problem. Macro risks are swamping credit risks but the macro risks are based on sovereign credit risks. There is feedback loop of crdit problems and then an economic slowdown. Rates have fallen, but there will come point where bond holders are not being compensated for risk. Riding momemtum in this environment is risky. The government knows this, so there is a movement to financial represssion. Cut-off all private avenues of safety so the only investment that may have some modest safety will be government bonds. Make holding private debt more risky through regulation and the only choice is the government. Under this repression scenario, negative real rates will exist and wealth will be taken from creditors. Redistribution will occur between the rich and poor through inflation taxing not income taxes. The vigilantes are not ready to press their case, but then it may be too late already. To get further improvement in the global economy, we need to have positive news in these four areas. Central banks - More liquidity is necessary especially from the ECB. the European central bank has made comments that are less hawkish and they have been willing to take almost any collateral, but more is needed in Europe to help banks. A rate cut and more assets on their balance sheet. The US has operation twist but a QE3 would support asset prices. There is more liquidity being provided in emerging markets, but the process has just begun after an early tightening cycle. The market wants to see more asset monetized. Growth path - Good economic news in Europe is critical given it is ready to fall into a recession, but the US needs to show better than trend growth to get a change in negative expectations. China needs to show more internal growth and not just increases in exports. Emerging markets growth will slow. This should be expected. The problem area is developed markets. Debt crisis - A bank recapitalization program is critical. Write-downs have to be taken and then capital raised for the banking sector. This is what will move the markets. US politics - No gridlock. Any cooperation will be a welcome sign. Here is a list of issues that have to be solved for the Greek problme to go away. The sell-of of assets - Th privatization is not taking place. Asset sales have to occur to reach debt targets. Once the sales occur, workers have to be willing to follow tasks to profit maximize. This cultural in not easy. Tax revenues and lay-off of government workers -We are seeing less revenue. Greeks are not paying taxes, so it will be hard to dig out of this hole. The VAT is not being paid by businesses. Workers still have to be laid off. 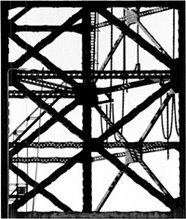 the structural problems still exist. The write-down of debt - Banks will have to write down debt and there will be a hit to capital. Banks will have to be recapitalized and or nationalized. This is still in the works. Country intransigence - Countries have to agree on further bail-outs. We are see small countries like Finland not willing to play ball. There needs to be agreement across all countries not just France and Germany. The package delay - There has been a package of funds available set for specific target dates. 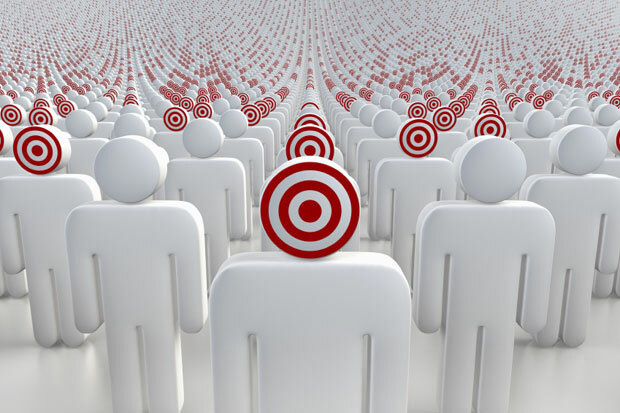 Every target date is a point of uncertainty that will not go away anytime soon. Can the euro make a comeback? ECB is less hawkish and the finance minsters are starting to develop better policies for the sovereign debt crisis. France and Germany are starting develop plans for shoring up banks hit with bad sovereign debt. There could be the potential for a gain in the euro. This could be a comeback, but it really was not the case that the euro fell that much. In the decade of its existence we have seen a significant increase in value of over fifty percent from lows and about 35 percent since the inception. With all of the EU problems, it hard to argue that we should see a 10-15 gain. A trading range is more likely. The negatives for the euro are still strong. A recession in the EU is most likely of any major economic regions. The lack of clear fiscal and monetary policy is still present. An improvement in the sovereign debt problem is not same as a solution. There is no euro comeback just a lower chance of a major fall. With higher agricultural prices, there had been a strong decline in subsidies by governments for the farm sector. The only exceptions are Russia and China. It is unlikely that we will see a return of these subsidies when or if prices fall. There is less money available. The reduction in subsidies will mean greater volatility in farm prices as the cushion is reduced. The market will not go back to the old methods, but there is still a mentality of support in some of the command and control economies. We do see that export restrictions, export support and intervention in global trade will still occur. This government activity will only make markets more volatile. There has been more talk about the wealth gap in the US. Median household income is falling. The percentage living in poverty is at about 15%. Isn't this the main reason for more ducation. The educated are doing well and those without skills are not. If you marry someone who is educated and working, you will do even better as a household. The answer is to get the poor educated with skills for work. Do it to the largest group by whatever means to met standards. Can you read instructions? Can you do simple math? Can you write a business letter? If you cannot do these things, you ill not get a degree. The economic cost of poor education on the economic and on the individual is very high. This is not about saving jobs but serving the next generation. Fed chairman Bernanke in comment last week suggested that there "will sluggish job growth in the period ahead" and that "persistent factors" are holding the economy back. He also said that monetary policy is a "powerful tool" but not "a panacea" Fiscal policy is critical but the Fed will "will continue to work to create an environment that provides the greatest possible economic opportunity for all Americans." No new policy but there seems a willingness of the Fed to engage in more behavior to help the economy. What may be a concern is the issue of hysteresis. A high unemployment rate that cannot be controlled by lead to a structural issue which will make it more difficult to rebound later. The longer someone is without work, the less likely he will find a new job. The fear is that allowing lower growth and the output gap to continue will cause a long-term harm. The Renminbi has increased about 7% in the last year. It has slowed recently as its is expected that the Chinese government wants to slow the appreciation until it knows what the US will do on trade restrictions. This is an interesting game of cat and mouse as the Chinese are willing to take the export hit from an appreciation but only if their goods can be sold across the world. Of course, the profit hit to Chinese companies is less clear than a trade restriction. An appreciation will reduce the cost of imported parts and make the exports more expensive. The result could be no change in exports. It has been surprising that a trade war has not occurred yet but this lack of action does not mean that we are out of the woods when it comes to country policies to boost exports and GDP at the expense of others. We forget that commodity prices are driving the growth in many emerging market countries. Across Latin America, commodity exports present anywhere form from just under 30% of GDP in Ecuador to about 5% in Brazil. The terms of trade have been made favorable given the gain in commodity prices but a global decline will shrink those gains. With a decline in commodity prices, tax revenue will decline, investment will fall, and currencies will depreciate. The gains of the last five years will be significant and more telling than the setbacks from 2008. Natural gas is the chemicals industry as flour is to a bakery. The impact of shale gas is not fully known, but it will change the US. recoverable shale gas could be as high as 862,000 bn cubic feet. This is the second highest in the world. China has the largest but other large shale gas deposits are in Argentina, Mexico, and South Africa. The US deposits are across number of fields, Marcellus, Utica in the East, Barnett in Texas and Haynesville in Texas and Louisiana. Ethylene costs in the US are lowest in the world outside of the Middle East given low natural gas costs. Japan spot prices are four times greater than prices in the US. The UK has natural gas costs which are twice the US. "The commanding general is well aware the forecasts are no good, however, he needs them for planning purposes" - story from Kenneth Arrow from his experience in WWII about the response when he suggested the weather forecasts were poor. The prediction business is difficult. we place our faith in experts because they can tell us many facts about a specific investment subject, but fact telling is not the same as forecasting. Fact telling should not be the basis for measuring the success of a forecasts. It should only be caste in results. However, there has to be a higher standard for success for someone who is not an expert and does not have command of the facts. Deficits without tears -- David Stockman explaining the effect of central bank buying debt. It looks like this will be the course taken by both the Fed and ECB. Of course, the Fed will have operation twist but there is no discussion about lowering balance sheet. Recent announcements by the ECB have them increasing their balance sheet through lending against government debt. The deficit without tears approach is the most likely course of policy in the next year if there is no active fiscal policy choices implemented. Many confuse the illusion of control and the illusion of prediction. We believe that we will have more predictive skill in those areas where we have more control. The control may likely come in the source and command of information. Experts feel they have better prediction skills because they have better command of the facts. In reality, this is not the case when actually tested. Experts have a tendency to be as wrong as others. They just have errors that seem to be in better command of the details. We do not have the power to control chance events. We are more sensitive to the illusion of control when there is the suggestion that there is skill in a random event. Whether a competition, the power of choice, something familiar or something where we have active involvement, there is the potential for the illusion of control. We remember past success in predicting random event and gain confidence in our ability when it may not be warranted. We also have a desirability bias with a tendency to over predict desirable outcomes and under-predict unwanted results. this is often why we miss bear markets and recessions. We do not want them to happen. As said by Werner Lambert about one pundit, "He is often wrong, but he is never in doubt." There are low threat and high threat political and economic environments. The work of psychologist S. Sales in the 1970's compared the 1920's versus the 1930's and found that the low threat environment of the 1920's (low employment and high income) versus high threat environment (high unemployment and low income) saw significant changes the behavior of society. As people move into high threat or high uncertainty environments, they will start to act less rational. They will look for extreme solutions not normally testable. They will have greater church going and engage in more extreme religion. They will ask for more authoritarian government in an effort to find solution to problems. We are in a high threat environment so there is a preoccupation with power and dominance, a willingness to submit to authority, less self-reflection, and a desire to exclude or punish those that move outside the norms of society. I could say that we have signs of this high threat environment in our current political environment. What does that mean for investing? There will be more risk of policy and market extremes. There is more likelihood that we will get extreme demands for more and stronger government. There will be more potential conflict across groups and countries because there is less willingness to compromise. there is higher likelihood for trade wars. More likelihood that politicians will not be willing to give on any position. A world of extremes is more likely in a high threat environment. This risk increases and the threats continue. The course of human history is strongly influenced by the growth of human knowledge, but we cannot predict when human knowledge will be gained. Hence we cannot predict what will happen in the future. The words of Karl Popper is the crux of the prediction problem. We do not know how events will unfold because the growth of knowledge is changing. We learn about new data. We hear about new policy alternatives and then we have to assess what its means. The market place see more knowledge and information flow than other places. Hence, there will be a higher level of uncertainty and a poorer ability to predict. The gold market is in disarray with an alternative view to the global crisis. In fact, all of the precious metals have declined as if there has been a solution to the debt crisis. In three sessions, gold has fallen $200/oz last month and is far from its highs in early September. The dollar rally may have something to do with this decline, but it is an odd event given the view that gold is perceived as a safety instrument.The VXX index has fallen from its highs but is still at elevated levels. Gold is at early August levels. Central banks still seem to be buyers with Thailand, Bolivia, and Tajikistan all increasing their gold reserves. It is the speculators who have exited the market. The high prices is causing a decrease in demand. High prices eventually have a bit in demand and margin has started to make the cost of speculator higher. Stock are still in a range but there has been a clear movement to higher levels since the lows in late September. We think the optimism in the gold market is misplaced. 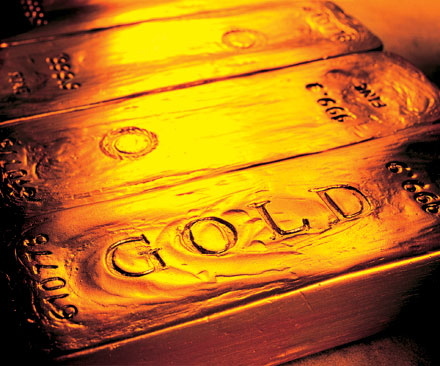 There is room for gold to retouch highs as the EU debt and banking crisis continues. "There will be no serious consequences in London resulting from the Wall Street slump." Even Keynes got the impact of the stock market crash in 1929 wrong, but he adapted and changed has thinking. The crash, like the Lehman failure, was just a symptom of a larger problem. In this case, a balance sheet recession. While Keynes was able to address the problem of a shortfall in aggregate demand during the 1930's, current economists have not developed a solution to the balance sheet recession problem.